Sand, Wind and Stars - LRDG, 70 years on: Podcast info. 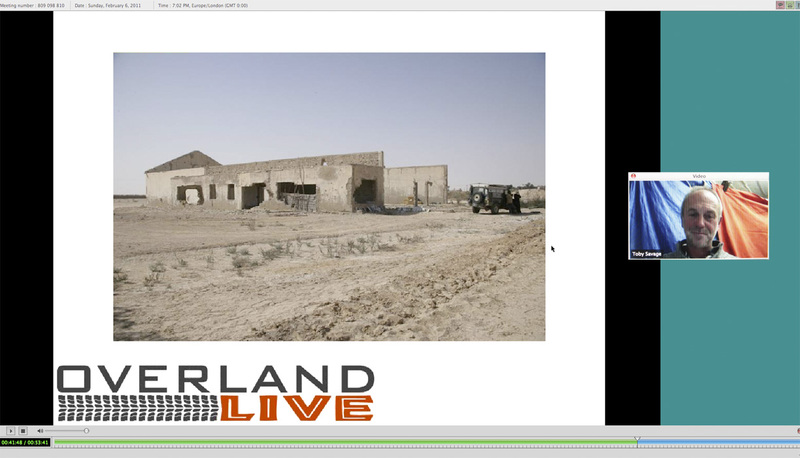 Fresh as a daisy after a 2000 mile haul back from Libya in my Land Rover, I presented a Podcast via Overland Live, administered in UK by the veritable Martin Solms in London. This relatively new means of communication allows the use of ‘meeting’ software to allow like minder people to broadcast their stories of Overland Travel to an International audience. It can also be watched retrospectively as a recorded item. Click here! 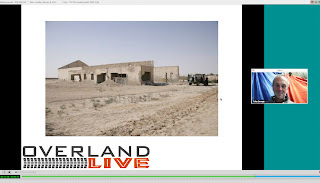 If you would like to watch/hear me talk about my recent trip to Libya and the motives behind the LRDG Expedition this Easter, please go to this link - You would be well advised to skip the first 10 minutes as we had a few ‘tekkies’. Labels: Looking tired, LRDG, needing sleep, North Africa, Overland Live. I have to comment that Toby is the perfect guest speaker and gave all the attendees itchy feet after wowing us about North Africa and his future trip. Well worth the time to listen to the show. I really enjoyed this! Carry on in this fashion and I am sure a guest spot on Question Time will be yours....! Closer to home, I so wish I wasn't a **yr old bloke with medical problems, else I should be sitting in the Jeep already!